Kia announced Wednesday that the body of the 2016 Kia Optima, which debuted at the New York Auto Show that day, would be more than 50 percent advanced high-strength steel. That more than doubles the amount of the light, strong metal in the 2015 Optima. 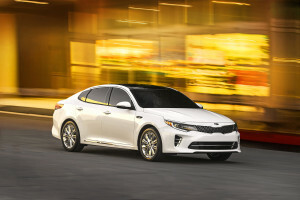 Besides the 150 percent increase in advanced high-strength steel, Kia revealed that 3.5 times more structural adhesives and 4.5 times more hot-stamped parts are in the 2016 Optima. “This body structure helps provide crash protection, better driving dynamics, and is the foundation for a quieter ride,” Kia said in a news release. Also on the advanced materials front, the sunroof support structure is made out of carbon fiber. High-strength steel can be more difficult to work with in the shop than the milder steel of the older days, and hot stamping can take steel into a ultra-high-strength range that can further affect how you handle repairs. You typically can’t heat or section either type of steel, and joining becomes trickier and requires more specialized equipment. Several other factors might be of interest to collision repairers. The suspension points of the front and rear subframes were moved for better geometry, and both have a four-bushing mount system. The wheel bearings are stronger in the front, and the dual lower control arms in the back are larger. The look of the A- and C-pillars was left intact, and there’s still a raised deck lid. Kia sales increased 8.4 percent in 2014 to more than 580,000 vehicles in America; it ranked No. 8 in units sold, according to GoodCarBadCar totals. While it’s no F-Series, the Optima was No. 28 out of models sold new last year and Kia’s No. 1 vehicle, rising 2 percent to 159,020 cars last year, GoodCarBadCar reported. So this development is something to keep in mind for your repair shop. Kia’s also tied to Hyundai, so whatever it learns with this vehicle could be applied for that make as well. Some new electronic features will be standard on the Optima: Curfew Alert, Geo-fencing, Speed Alert and Driver Score. The first three allow the car owner to keep tabs on a new or untrustworthy driver (a teenager, perhaps, or a cheating or barfly spouse) by letting you know if the motorist breaks the speed limit, takes the car out late or drives somewhere they shouldn’t be driving. Driver Score looks at hard breaking and smoothness with the accelerator. For now, Kia says it is for “informational purposes,” but it wouldn’t be surprising to see them take it and partner with an insurer the way GM married OnStar to Progressive’s Snapshot. That brings its own complications for drivers and collision repairers, as we discussed in that article. Every 2016 Optima will include an option for a rear-camera display, and the SX and SXL versions can provide a 360-degree view. Other options that could cut down on crashes include a blind-spot monitor, cross-traffic alert, automatic braking and an advanced cruise control which keeps tabs on what the driver in front of you is doing. Kia is also debuting for the first time headlights that automatically bend and switch from high to low beam when they sense traffic. While good for safety, these all could mean fewer crashes. More high-tech components could make what repairs do happen cost more in parts.